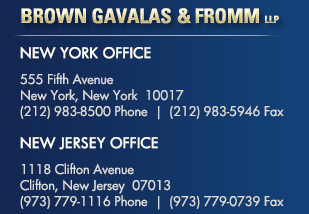 Brown Gavalas & Fromm is renowned for its expertise in maritime, aviation, transportation, insurance coverage, international law and defense of liabilities. Our reputation is based on an unwavering commitment to our clients, deep knowledge in our core practice areas and creativity in resolving complex legal problems. Remaining committed to these principles has allowed us, year after year, to provide result-oriented services to our clients in a cost-effective manner. The partners of the Firm are distinctly qualified practitioners with extensive experience in their areas of practice. The partners are complemented by a close-knit group of dedicated and hard working associates, paralegals and support staff. Many of our attorneys are multilingual, which enables us to meet the demands of our international practice. We maintain offices in New York and New Jersey and our attorneys are admitted in numerous additional jurisdictions in the United States. We also maintain the most advanced technology and information systems. Our advanced information systems allow us to perform our work in an efficient and cost effective manner. Our clients are kept fully informed as we believe that the best results are obtained when the Firm and its clients work closely together. In addition to traditional billing on an hourly rate, we offer our clients alternative approaches that may be better suited to their planning and budgeting needs.